America’s iconic Great Salt Lake is rapidly shrinking due to drought, climate change and misguided water management schemes. Utah is considering another major water diversion project that would further deplete the lake's inflows. Photo by Jeremy P. Jacobs. Article updated at 5:18 p.m. EDT. 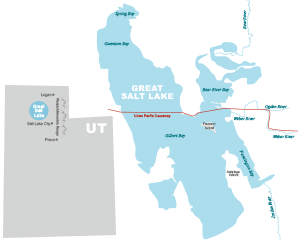 SALT LAKE CITY, Utah -- For a long time, the lake that lends its name to this city was taken for granted by most here and treated as a sewer by some of the nation's biggest polluters. But the Great Salt Lake can no longer be ignored. The lake is afflicted with all the problems facing lakes in the American West, including misguided water management schemes, historic drought and climate change. When pioneers arrived here in the 19th century, the Great Salt Lake was one of the largest salt lakes in the world -- a shallow body of water that naturally ranged from 990 to 2,340 square miles. Greenwire examines water-management blunders that are turning the West's once-magnificent salt lakes into hotbeds of toxic air pollution. View the report. It's now near its lowest point. Diversions that have taken 39 percent of the lake's inflows have caused the lake level to drop 11 feet, and it has lost 48 percent of its volume. At least 550 square miles of lake bed is now dry, an area five times the size of Owens Lake -- the site of Los Angeles' water grab at the turn of the 20th century, which led to dust bowl conditions there (Greenwire, June 6). Dust storms occur regularly in the Great Salt Lake region, and research suggests the lake breathes contaminants -- inhaling filthy air from cities, adding to it and then exhaling it right back at population centers. The public health consequences of that pollution will be worse than what has occurred at California's imperiled salt lakes, experts say. More than two-thirds of Utah's rapidly growing population -- 2 million people -- breathes that pollution. Geography, atmospheric conditions and the desert landscape are a perfect recipe for dust in an area that already regularly exceeds federal pollution standards. And research suggests the Great Salt Lake isn't even emitting that much dust yet. That may change the longer the lake's crusts dry out, causing the wind to blow dust that -- like dust from California's Salton Sea -- could carry heavy metals and other toxins dumped by mines and smelters. "If it dries out for years, it could become a different surface and much more prone to dust," said Erik Crosman, an atmospheric scientist at the University of Utah. "It could be a disaster if that ends up happening." The area also regularly exceeds federal limits for ozone, and a shriveling Great Salt Lake may exacerbate that problem. Crosman described the lake as a "toxic fish bowl" for bad air quality. Effects on wildlife would be equally severe -- and costly. Up to 5 million birds stop at the Great Salt Lake on their migrations every year. The last remaining organisms surviving in the lake are tiny brine shrimp, and their harvest is a $57-million-per-year industry. And the worst may be ahead. Utah is considering major development along the Bear River, a tributary that has historically provided nearly 60 percent of the lake's inflows. The proposed $1.5 billion project would include multiple dams and reservoirs to serve cities and farms in northeast Utah. It would significantly reduce the amount of water that reaches the lake, exposing miles more of the lake bed. 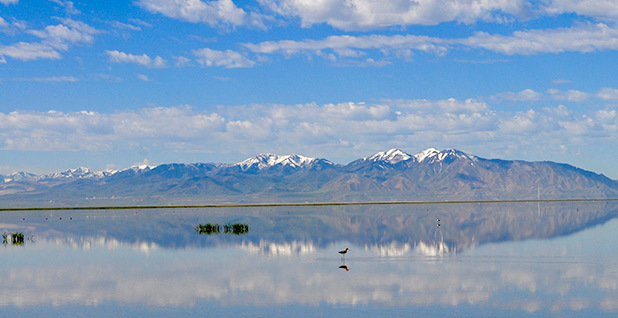 The proposal makes the Great Salt Lake ground zero in the West's struggle to balance growing populations and increasingly depleted water resources. Scientists who have studied the lake for decades say its trajectory combined with the new project would start a death spiral. "The lake is dynamic, it's always changing, and it's risen and fallen throughout time," said John Luft, Great Salt Lake Ecosystem Program manager for the Utah Division of Wildlife Resources. "But this is different. The cumulative impacts of population growth and climate change will increase water consumption. Rather than moving away, people will continue to make this their home. If we are not more conscientious about our water use, we will be facing a disappearing lake." The Great Salt Lake is a remnant of Lake Bonneville, which formed during the glacial age 32,000 years ago and covered 20,000 square miles of what is now Utah, Nevada and Idaho. The modern Great Salt Lake -- a sprawling, extremely shallow water body whose lake level can fluctuate dramatically -- formed about 11,000 years ago. It is the country's largest lake outside of the Great Lakes, despite being nestled in an area with the country's driest climate. Historian Dale Morgan in 1947 called it a "lake of paradoxes." "In a country where water is life itself and land has little value without it," he wrote, "Great Salt Lake is an ironical joke of nature -- water that is itself more desert than a desert." On a recent tour of Farmington Bay, Utah State University professor Wayne Wurtsbaugh said the lake's water and ecosystem have historically been seen as having no value. Diversions of freshwater inflows began in the 19th century. Extraction of salt, magnesium and other minerals ramped up. Polluters like mining companies dumped tons of contaminants, including heavy metals like lead and copper, into the lake. Utah State University professor Wayne Wurtsbaugh is a leading researcher on the Great Salt Lake and one of its staunchest defenders. Photo by Jeremy P. Jacobs. By the 1950s, the lake was generally considered dead, and a 20-mile rail causeway was constructed across it, effectively dividing the lake into bays. Wurtsbaugh, 68, is one of the lake's staunchest defenders. He is friendly and avuncular, and his car's bumper sticker says, "Have you hugged a limnologist today?" (Limnologists study inland water bodies.) He made the bumper sticker himself and hands out copies at conferences. Research on the lake's health and ecosystems is still in early phases, but Wurtsbaugh said there is some recognition now of the lake's value to birds and other wildlife. "We've got big issues to deal with," he said. "We need to take a long-term perspective." Still, there are currently few protections for the lake. Its water level has fallen at least 11 feet since the original settlers came, and salinity levels range from four to more than seven times higher than what's found in the ocean. Farmington Bay -- 157 square miles -- is now about 85 percent dry, and more than 50 percent of its inflows are piped in as treated wastewater. There are no water quality regulations for discharges to the lake, boosting levels of nitrogen and phosphorus that overfertilize the water and spark stubborn algal blooms, raising a fierce stench. Duck hunters refer to where the wastewater pipe meets the bay as a rendezvous point called "stinky." Sarah Null, who works with Wurtsbaugh at Utah State University, said people no longer view the lake as a sump for the area's waste. However, she added that water that flows into the lake is still largely viewed as wasted. "I wouldn't say it's a dumping ground," Null said. "But as for water, it is certainly true that there are no regulated flows into the Great Salt Lake. It gets what's left over, and people certainly refer to it as waste. They see that water was wasted." The push to grab fresh water flowing to the Great Salt Lake may soon yield a serious threat to public health. Salt Lake City and the area surrounding it are already plagued by a three-pronged air pollution problem that makes breathing a misery: winter dust, summer ozone, and occasional spring and summer dust storms. The challenges facing the Great Salt Lake, including the Bear River project, underscore the complications of protecting all imperiled lakes in the American West. While many blame climate change and drought, studies suggest diversions for human use are destroying the lakes. Johnnie Moore of the University of Montana this year studied Lake Abert, another terminal salt lake in central Oregon that has gone dry. His broad conclusion: "Human water use has become a defining aspect" of the salt lakes' "survivability in a warming world." "As shown at Lake Abert, those human-caused changes can far outweigh the natural responses to drought," he wrote. "Without upstream withdrawals, the Lake Abert ecosystem would have been stressed in recent droughts, but not decimated as it has been in the last two years." Utah's water law -- like California's -- requires that water be put to a "reasonable and beneficial" use. Once water reaches the lake, it's no longer considered beneficial. Advocates like Lynn de Freitas of Friends of Great Salt Lake are calling for a regime change for managing these water bodies. "These saline systems are going to be the last in line -- if they are in line at all. I do see it as really critical," she said. "We have got to get some triage going here before it's too late." De Freitas said she may push for a lake elevation rubric comparable to what has been used at California's Mono Lake. And, taking another cue from Mono Lake, she said she would also consider bringing a lawsuit or other action to attempt to protect the lake under the public trust doctrine (Greenwire, June 27). But de Freitas acknowledged that is an uphill fight in Utah, a state that has historically been less concerned about environmental impacts than California. Moore said in an interview that the window to act is closing. In areas of rapid growth -- like the Great Salt Lake region -- once water is taken from the lake system, it likely will never return. "You have a decade or two to make those things happen, or you'll be in a system that, politically, it's impossible to change," he said. "Human effects will get greater and greater, and then there will be no political way to reallocate water." Moore added that -- hydrologically -- solutions are fairly simple, including mandated stream flows or other water budgets. Geoff McQuilkin of the Mono Lake Committee said he would hope Utah will learn from the other salt lakes -- including Owens and Mono lakes and the Salton Sea. "The lesson," he said, "is it's a lot harder to fix things afterward then make good planning decisions going in." Many air issues stem from geography, atmospheric conditions and other dry lake beds that spew dust. The Great Salt Lake is just west of a series of cities, from Brigham City in the north down through Salt Lake City to Provo. 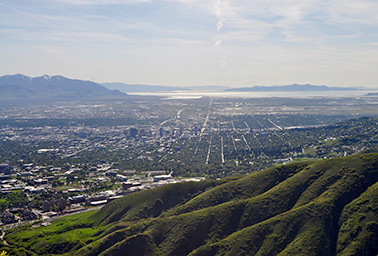 Known as the Wasatch Front, the metropolitan areas are home to more than 2 million people -- over 70 percent of Utah's population -- and are sandwiched between the lake's basin to the west and the Wasatch Range to the east, a natural trap for polluted air. The area is also prone to atmospheric inversions, where elevated warm air traps cooler air below. Already, the region suffers from at least one major dust event a year when it's difficult for a person to see farther than a third of a mile. Researchers are only beginning to study how the lake influences air pollution. Derek Mallia of the University of Utah is working on models to determine how dust from the Great Salt Lake's lake bed, or playa, affects particulate matter levels. U.S. EPA's standard for particles 2.5 micrometers in diameter or less, or PM2.5, which are considered extremely harmful to respiratory health, is 35 micrograms per cubic meter averaged over 24 hours. In the winter, Mallia said, the area hits 45 to 50 micrograms of PM2.5 per cubic meter due to automobile and other emissions that are trapped by inversions and geography. He added that currently, most of those particles during the rest of the year are coming from other sources -- wildfires, the Bonneville Salt Flats to the west or other dried lakes like Sevier Lake to the south. Winds, he said, carry that dust into the Great Salt Lake Basin. "The majority of the dust emissions we are seeing in Salt Lake City are occurring from playa surfaces," Mallia said. "It makes these events more frequent." The lake also breathes air pollution, potentially making it worse. Crosman said the lake seems to inhale urban pollution all night and into the morning, including PM2.5 and ozone precursors like nitrogen oxides and volatile organic compounds from auto exhaust and other sources. Then the sun cooks those contaminants over the lake, causing chemical reactions that convert them to ozone. Later in the day, the lake exhales -- blowing ozone and particles toward the cities. Ozone levels around Salt Lake City can already reach 91 parts per billion -- the federal standard is 70 ppb averaged over eight hours. There is some research to suggest amounts as low as 65 ppb can be harmful. Crosman said what concerns him about the lake's recession is that more exposed lake bed could lead to more ozone because the sun will reflect off more white playa, in what scientists call the albedo effect. That increases the energy coming off the lake, which in turn may accelerate ozone chemical reactions. "You are essentially doubling your photochemical reaction rates," Crosman said. Scientists are also concerned about what is in the Great Salt Lake's dust. Much like with California's Salton Sea, the lake's history as a dumping ground has led many to suspect that a host of toxic metals, including lead and arsenic, might be embedded in the playa -- all of which could make dust more harmful if it blows into Utah's cities. Little is known about the dust. 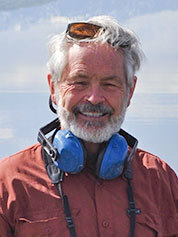 Kevin Perry of the University of Utah recently launched a state-funded study to sample the exposed playa. So far, Perry said, it doesn't look like the lake emits dust as easily as the Salton Sea -- though he isn't sure why. "If this source were to take off like the Salton Sea, with these 2 million people here, it would cause all sorts of problems," he said. Perry and others worry that the trigger could be a major water development project that would further deplete the Great Salt Lake's inflows. Utah faces challenges in providing water to its agriculture areas and rapidly growing urban centers near the Great Salt Lake, here in the distance beyond Salt Lake City. Photo by Jeremy P. Jacobs. The governor and state Legislature have directed Utah's Division of Water Resources to weigh building multiple dams and reservoirs along the Bear River, a parabola that begins in Utah before looping north into Wyoming and Idaho before descending through northeast Utah and into the lake. Eric Millis, the division's director, said Utah's population is expected to double to 6 million by 2060, requiring more water for municipal and agricultural use. "We believe that additional water will need to be developed," Millis said, adding that the division hopes to have the water online by 2040 or 2045. That means the environmental review process will need to begin around 2020, and the division is weighing sites for reservoirs. The proposal alarms lake advocates. The Bear River is the lake's primary source of water, typically accounting for nearly 60 percent of its inflows -- an average of more than 1.3 million acre-feet. Utah plans to develop 220,000 acre-feet of water with the project, at least 80,000 acre-feet of which would not make it back to the lake. Millis acknowledged that the potential dam sites under consideration are "not optimal," and said the state will consider dust control measures like those used at Owens Lake in California if it concludes that the depleted flows would increase air pollution. But he emphasized that the state must plan for a larger population's water needs. "We've just got to keep our options open," he said. Wurtsbaugh and others estimate the project would lower lake levels by at least another 8.5 inches and expose another 30 square miles of playa. The two bays closest to the Wasatch Front -- Farmington and Bear River -- could completely dry up. Lake advocates strongly criticize the proposal from ecological, environmental and even political perspectives. The project "is the answer to the wrong question," said Lynn de Freitas of Friends of Great Salt Lake. "It's not being realistic in how we are looking at Utah's water future." Daniel McCool, a political science professor at the University of Utah, said dams and reservoirs are outdated solutions to water problems that run afoul of the state's reputation for political independence. He called it the "most expensive possible solution" with the "greatest environmental impact" that removes all "individual choice or freedom with it." Stan Senner of the National Audubon Society said the proposal would significantly damage a saline lake system that is pivotal to birds on the Pacific Flyway. "What you see in so many of these places is a death by a thousand cuts," Senner said. "And this is a big cut. It's not a little nick. It's a big one."